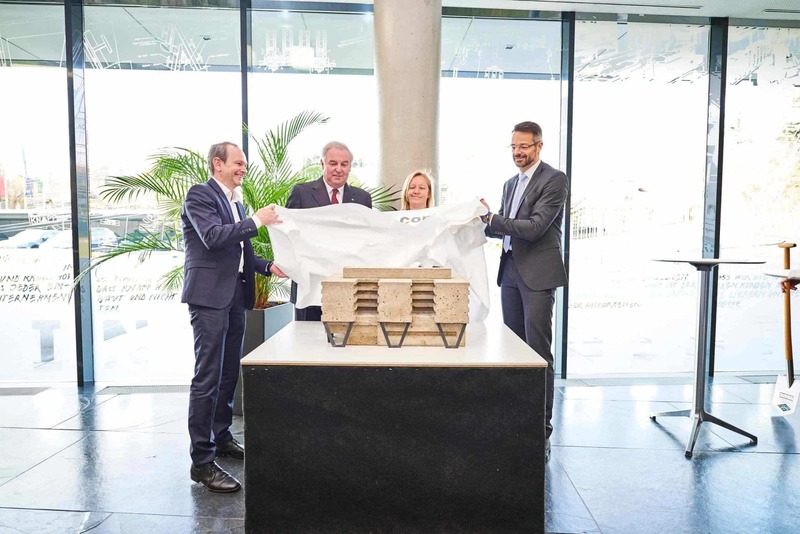 After the completion of the Corporate Headquarters and Development Centre in 2011, KNAPP AG is again investing in its Hart bei Graz location. 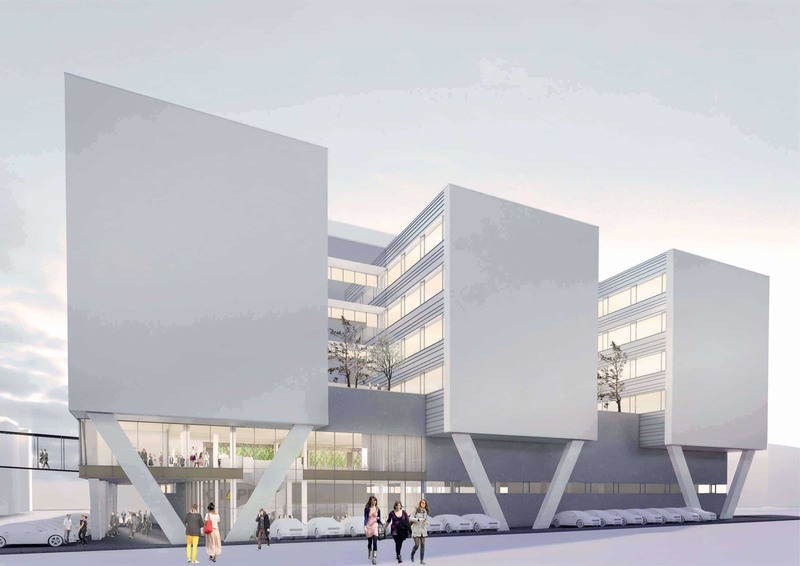 A modern six-story office building with an Innovation Centre will be completed by the autumn of 2019. Two production halls will also be erected as well as a large photovoltaic plant for efficient energy management. KNAPP’s latest building project starts with the ground-breaking ceremony on March 16, 2018. 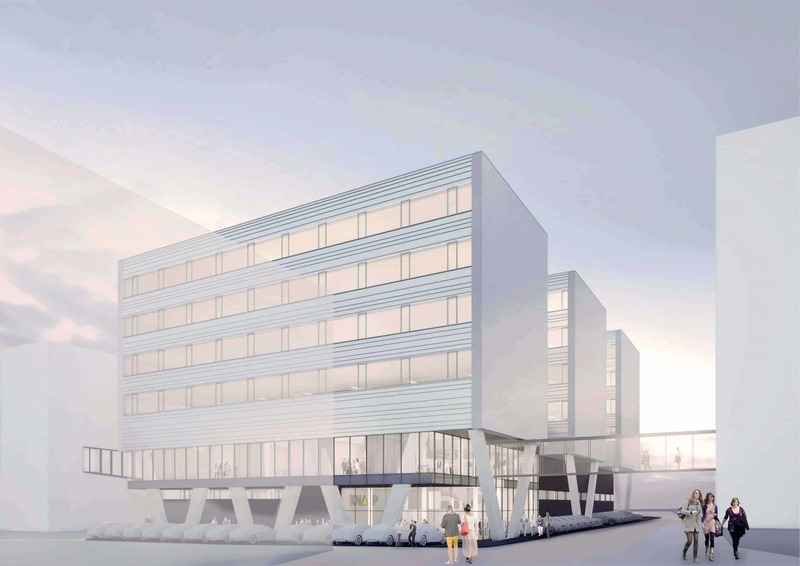 The constantly growing number of employees – since 2004, the number of employees at the headquarters of the Styrian logistics company in Hart bei Graz has more than doubled from 1,000 to around 2,200 – and the associated lack of office space is just one of the reasons for the investment. KNAPP is growing on average by 150 new employees every year at the Hart bei Graz location alone and is constantly on the lookout for qualified technicians, especially in software and IT, but also for the planning, development and startup of logistics systems. “In recent years, our order receipt has shown growth of 15 to 16 percent, our sales have increased by an average of 14.5 and our profitability by 21 percent. This growth requires us to follow suit with our infrastructure both at our subsidiaries as well as here at the Hart bei Graz site,” declared KNAPP COO Franz Mathi about the motives behind the building expansion. The Innovation Centre is being built where an old production hall once stood. The first construction machines are already up and running and will transform one part of the company premises for about 20 months into an impressive construction site. The new company building has a distinctive modern design and will be economically heated by district heating. Next to a reception area on the ground floor, rooms are planned for employee and customer events as well as a separate theatre/lecture hall with space for 130 people. 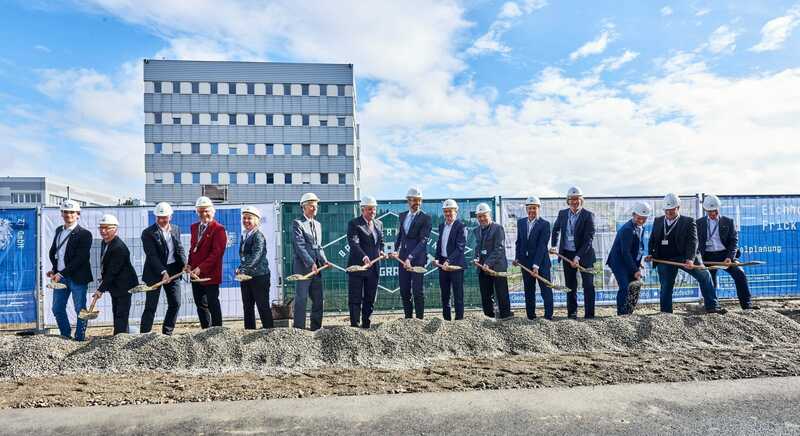 The building will have an upscale showroom with a 10-metre-high ceiling, in which KNAPP can present its customers and guests with the latest technologies in the world of warehouse logistics. Offices across four floors will provide 470 employees with a state-of-the-art work environment. The building wings are arranged in a comb formation, so the light-flooded offices are all just steps away from each other. The sizes of the rooms can be flexibly adapted and offer optimal opportunities for communication. All office floors have open spaces in the form of covered, recessed balconies. Landscaped roof terraces also form four courtyards that are designed for informal use by employees. The ground-breaking will be celebrated on March 16, 2018 with the KNAPP AG Managing Board, Gerald Hofer and Franz Mathi, the Knapp family and numerous honoured guests including Governor Hermann Schützenhöfer, Member of the National Council Verena Nussbaum, District Governor Burkhard Thierrichter and Hart bei Graz Mayor Jakob Frey, as well as the planners and builders of the partnering companies Bramberger architects, Eichholzer-Frick ZT, Thomas Lorenz ZT und building company Granit. Governor Hermann Schützenhöfer is thrilled about the boost this investment will give Styria: “KNAPP is setting an example of how Styrian innovation can create new perspectives. This ground-breaking ceremony marks the first step in creating workplaces for Styrians fit for the future. As a result, the KNAPP Innovation Centre is creating work for the region. With a research and development quota of 5.14 %, Styria is already THE innovation state in Austria and together with eminent companies and first-class education institutions, we are making sure that it stays this way.” In his welcoming speech, Schützenhöfer also thanked those responsible at KNAPP for making the company one of the most successful providers of logistics solutions, enabling it to employ 2,500 people in Styria. In parallel to the new building, a production hall will be expanded. Across 10,000 m², two more halls will be in construction, effectively doubling the production space. Here, there will also be work stations for around 150 employees. The stand-alone power supply is provided by two powerful rooftop photovoltaic systems on top of the two halls. All in all, KNAPP will be investing the equivalent of about a year’s profit – a clear commitment to the site. KNAPP is a leading global provider of all-in-one intralogistics solutions and automated storage systems, and has specialized in the core sectors pharma, fashion, retail, food retail and industry. Each year, KNAPP invests around 30 million euros in research and development and its innovative solutions have made lasting impacts on the logistics sector time after time. With over 3,350 employees, the company generated a turnover of 632 million euros in the past business year.